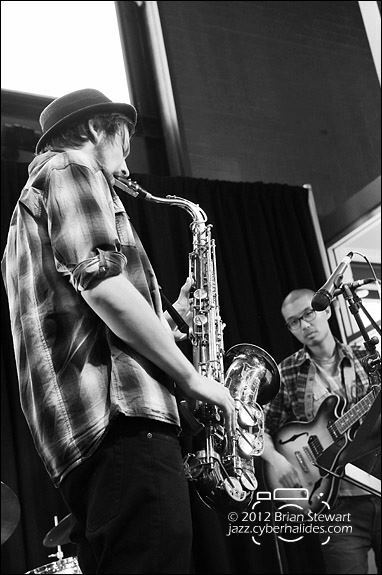 Shaun Rammers is a saxophonist and composer who is a part of the jazz and improvised music scene in Australia. Shaun released two albums as a leader and co-leader in 2017. He relocated to Melbourne in 2014 after graduating from the WA Academy of Performing Arts with a Bachelor of Music in Jazz Performance with Honours. Shaun had the privilege of studying with Jamie Oehlers and Tom O’Halloran during his four years at WAAPA, along with many special guest teachers along the way. These included Dave Ades, Ben Wendel, George Garzone and Steve Magnusson. He has also been involved in numerous workshopping events, with highlights including the School for Improvisation at New York University run by Ralph Alessi in 2011 and the Creative Music Intensive run by the Australian Art Orchestra in 2015. “At The Brunswick Green” is an album released by Question Time, a band co- led by Shaun and trumpeter Andrew Gioia, featuring music composed by both leaders. The band weaves through melodic and rhythmic ideas, creating interesting, high-energy music, whilst still being quirky and fun. In 2017 Question Time toured to Perth to perform at Tura New Music’s festival “Audible Edge” then later in the year travelled to Sydney and Canberra to promote their album. Shaun is currently also a member of Unfix, a large improvising ensemble lead by Joe O’Connor, which in collaboration with the Penny String Quartet recorded “Self Aware of Myself” featuring music composed by Ben Harrison, Reuben Lewis, James Macaulay and Joe O’connor. In addition to all this, Shaun is a member of Fabric, and improvising trio co- led by Ronny Ferella, Mick Meagher and himself. Fabric is planning on releasing its debut recording in early 2018. Shaun has performed many with artists, including Sam Anning, Tom O’halloran, Carl Mackey, Tamara Murphy, Ben Vanderwal, Peter Knight and Sandy Evans at venues all around the country including, Uptown Jazz Café, Jazzlab, Bennett’s Lane Jazz Club, Ellington Jazz Club in Perth, the Sydney Opera House and MONA in Hobart. Shaun is constantly striving to develop as a creative musician, endeavouring to form his own voice within Australia’s exceptional music scene.